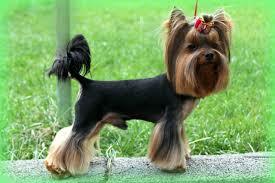 The Yorkshire Terrier is the most popular toy dog breed in the United States. It is so popular, not only for its obvious cuteness, but for its feisty but loving personality. 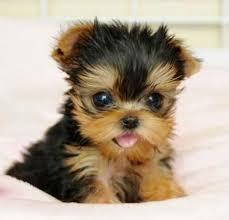 Yorkies are very devoted to their owners and are perfect for apartment living as well as house living. Yorkies are companion dogs so they love to be with people at all times. They are very small, ranging from 8 to 9 inches tall at the shoulder and they only weigh 4 to six pounds which is very petite. Their lifespan is a nice and long 12 to 15 years so this dog can be part of your life for a good amount of time. The Yorkshire Terrier that we know and love today was not always was it was. It all started with the Industrial Revolution in England when Scottish workers came to Yorkshire, a town in England, to work in the coal mines textile mills, and factories. These workers brought dogs with them known as a Clydesdale Terrier. These dogs were much bigger than the Yorkshire Terrier and was used to catch rats in the mills. The Clydesdale Terrier was then most likely bred with other types of terriers in England which then resulted in the Yorkshire Terrier. The Yorkie was a small dog with a long blue-gray coat that became famous through many dog shows. The Yorkshire Terrier was registered in the British Kennel Club stud book in 1874 and the first Yorkshire Terrier breed club formed in England in 1898. 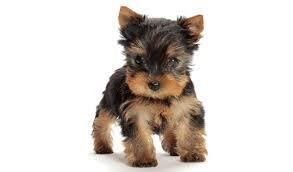 The earliest record of a Yorkshire Terrier being born in the United States in 1872. With the perfect combination of endearingly small size and adventurous spirit, the Yorkshire Terrier is also smart and self-assured. However, your Yorkie’s personality comes all from how you train and socialize them. If you set limits and train your Yorkie well, then they will be a wonderful companion but if you do not train them well, you are in danger of having a very spoiled dog. Yorkies need very early socialization which includes exposure to different people, sights, sounds, and experiences when they are young to make sure you have a friendly and well-rounded dog. Also, it is important to know that all Yorkies have very different and unique personalities. Some can be cuddly and perky, showing love and affection to their owners while others can be mischievous, outgoing, and up for anything. If you are looking for a certain personality, try to see how the puppy interacts with you the first time you meet them. Everyone knows the 1939 film, The Wizard of Oz. While the main characters are Dorothy, the Tin Man, the Scarecrow, and the Lion, there is one character that steals the show: Toto. 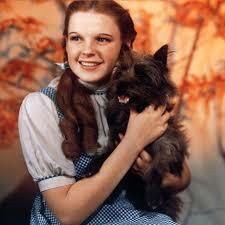 Toto is the black Yorkshire terrier that played Dorothy’s faithful companion and friend. The dog that played Toto is Terry who had a very interesting life. Terry was said to be born in 1933 in California where he was adopted by a married couple who had did not have the capacity to train Terry in any way. The couple then sent Terry to Carl Spitz who was a dog trainer as well as trained dogs for show business. When Spits called the couple to get Terry back, they never payed the bill or even picked Terry back up. With this, Spits took terry in as his own and started to take Terry to all types of auditions. Terry’s first movie was Bright Eyes which was a movie starring Shirley Temple. After five different films, Terry got the part of Toto in the Wizard of Oz. Terry excelled on the set and connected with Judy Garland so well, especially when she was singing. Terry was paid $125 per week which was more than what the actors who played the Munchkins received. Terry received amazing reviews and even got his name official changed to Toto at the end of the film. Looking for a feisty Yorkie to brighten up your life? Check out all of these adoptable puppies! That’s surprising that Toto was paid more than some of the Munchkins! I also never knew that Yorkshire terriers were named after a coalminer’s town. I wonder if modern-day Yorkshire terriers would be able to catch the rats in the mills the way the older Clydesdale terriers did, or if they are too small to run fast enough. As always, so cute! I have to admit I’m personally a bigger fan of West Highland Terriers than Yorkies, but this post was still nice. I liked how you mentioned the dog from the Wizard of Oz because I was definitely thinking about him while reading your article! Love of my Life Westie they are the best dogs.